The DeWALT Portable Power Station truly is an impressive piece of technology that any professional or serious DIYer should have when working. The beauty of the DeWALT Power Station is that it enables you to power your tools anywhere you want to work without having to worry about the logistics of finding external power. And, it bypasses your need to use a noisy portable generator. It runs on four DEWALT 20V MAX* batteries which includes the innovative DeWALT FLEXVOLT battery system. We delve into all of the features and details of the DeWALT Portable Power Station in this article to help you determine if this is the right product for what you need. But, to be honest, if you use DeWALT tools this is a “must buy” product. We give you the facts so you can decide for yourself. I’ve already been thoroughly impressed by the DeWalt FlexVolt batteries which have changed the way we see battery operated tools. It’s true that battery powered tools are becoming more popular, replacing many tools that were once considered only for use when we had an AC power supply. But there are times when we still need AC power to run, not only power tools but many other electric devices. *Learn more by reading the manual for the DeWalt Portable Power Station. The preferred position of the portable power station/charger is on its feet or on its back. Do not operate the portable power station/charger balanced on its side. Do not use portable power station/charger to power medical or other critical devices. Do not expose to water, rain, snow, or any type of moisture. Use of undersize extension cord(s) could result in overheating of the wires or attached items, resulting in fire. The portable power station/charger is not user-serviceable. Battery packs are not serviceable. Much better than using a gas generator. Highly versatile. DeWalt portable power station/charger outputs a modified sine wave. ✓ View or download the MANUAL or the QUICK START GUIDE for the DeWalt Portable Power Station (DCB1800B). The DeWalt Power Station comes in two options and the DCB1800B is the cheaper version if you are already using their 20V Max batteries or 60V/20V FlexVolt batteries. It uses four 20V batteries to run the modified sine wave inverter to give you reliable AC power anywhere, anytime. Not only is this the perfect way to keep your corded tools running off a silent power supply, but it doubles as a high-powered charger. When plugged into the mains, the four parallel battery ports become a charging station for your 20V or FlexVolt batteries. It’s, therefore, an inverter-charger, providing a rapid charge for up to 4 X 4AH batteries within 2-hours. Designed for ease-of-use and portability. Rugged & durable construction. When it comes to portability, there can be no comparison. The DeWalt DCB1800B Power Station weighs only 18 LBS. This is without batteries, so the weight will increase depending on what batteries you’re using. Though, even with the largest batteries, it’s by no means heavy and can be easily carried in one hand. It’s very compact and you won’t find an equivalent AC power generator that will measure up to this inverter. Its dimensions are Height: 10.75”; Width: 21.3” and Length: 12.75”. You can fit into the trunk of a compact car. The design is as rugged as it gets. Naturally, we wouldn’t expect anything less from DeWalt. It has a tough roll cage that incorporates two sturdy carrying handles so you can transport it anywhere, knowing that it can take the punch. It’s designed to withstand the harsh conditions of any job site. This bundle includes everything you need to get started. **Same as the DCB1800B but this package includes batteries. A better value. Though this is the same Power Station as the DeWalt DCB1800B , they market it as a separate model. This one includes 3 X 20V Max batteries and 1 X 20V/60V FlexVolt battery. If you don’t already have batteries or would like to have the extra batteries, this is the one to go for. There’s no hassle getting started with the DeWalt Power Station. You slip four fully charged 20V or FlexVolt batteries into position, switch it on and there you go. It takes less than a minute to get to work. What you really want to know is how does the DeWalt Power Station perform when you’re on the job? As an example, let’s take a high current power tool like the DeWalt DW734 thickness planer, I chose this one because it’s probably one of the most powerful tools one would be using on site and therefore, gives you an idea of what to expect when pushing the Power Station to the limit. Surrounded by a strong roll-cage for protection and portability. Running the thickness planer continuously, you’ll get about half an hour on the three 20AH and one FlexVolt battery combination that comes with the DeWalt DCB1800M3T1. Not impressed? Step your batteries up to four FlexVolt batteries and you’ll get close to an hour with the same machine using the 6AH FlexVolt batteries and 30% longer with 9AH FlexVolt batteries. Do you still want more working time? You can have limitless working time if you keep standby batteries. Each time you add four batteries to your collection, you’ll double your working time. Okay, now you’re looking at the price of the additional batteries, maybe using 12 batteries will look like a good working time. You may take a step back and gasp at the cost of buying all these batteries. But take a minute to think about properly. 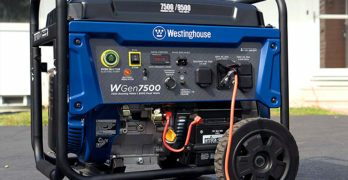 How much gas would you be burning through each time you run a generator for the same amount of time? Then look at your generator maintenance costs over the years. By doing a few simple sums in my head, the DeWalt Power Station should pay for itself within a year of regular use if compared to using a gas generator for the same purpose. Then there’s all those benefits – silent operation, no fumes and quick set up time. No to mention that it’s small and easy carry anywhere. VIDEO | DeWalt Portable Power Station | How it Works? I’ve been using inverters for a long time now and I can say with complete confidence that they don’t give up. A quality inverter is going to last for ten years or more with no maintenance costs or any downtime. If one considers DeWalt’s longstanding reputation for robust build standards, you should be assured of many years of reliable service, hassle-free. Their warranty is one of the best you’ll find. The Power Station comes with the standard DeWalt 3-year limited warranty. DeWalt limitations on their warranty agreement are very basic and you virtually have to break it deliberately before they won’t honor their agreement. You also get a 90-day money back guarantee and a 1-year free service plan. For contractors and emergency workers, the Power Station is an excellent solution in many situations. You may need to use powerful halogen lamps when working at night and there’s no power available or an electric cord chainsaw far from a power source. Because the DeWalt Power Station is so light and small, you can keep it in your vehicle at all times. This means in any emergency, you have power without needing any gas. The DeWalt Power Station can double as a backup power supply for your home. When you experience an unexpected power outage, there’s no need to haul out a generator, start it up and start running extension cords all over the place. You can set the DeWalt Power Station up right in your living room and plug whatever you want directly into the outlet socket. No noise, no fumes, and no gas needed. Do you like to spend the day fishing? Well, you can take the Power Station along and have the convenience of electricity with you. What equipment can you run using the DeWalt Power Station? I’ve already mentioned the DeWalt DW734 thickness planer as an example. In fact, any of the portable AC tools in the DeWalt range will run off the Power Station. This will also include other brands and most compressors, too. On many construction sites, you’ll want to use circular saws and other woodworking equipment on AC power. Of course, the Flexvolt 120V range covers most of these tools, but you may not be ready to replace your entire range of AC tools to battery power. Buying one Power Station will work out cheaper than replacing a whole range of tools that still have many years of life left in them. With the exception of welders, all the tools that you may want to use on site should be covered. Generally, the most powerful tools use a 1200W motor with a peak load of around 3000W, this falls well within the range of the DeWalt Power Station. So whilst running your miter saw or other high-current tools, you can still use a couple of drills or other hand tools. VIDEO | How the DeWalt FLEXVOLT Batteries Work? If you’re using the DeWalt Power Station, having the best battery technology is going to give you the longest working time. The DeWalt 20V/60V FlexVolt battery is their best technology to date. Not only can you use them to give you the maximum working time when running the Power Station AC inverter, but they will work in all DeWalt FlexVolt or 20V Max tools. The FlexVolt battery system is backward compatible, so even their older technology battery tools will work with these batteries, as long as they are rated for 20V. The new range of 60V and 120V FlexVolt tools use the most advanced technology to give some of the best working times in their class. Very few batteries have the same working time. The FlexVolt battery range gives you a choice of either 9AH or 6AH that can switch between 20V and 60V, depending on which type of tool you’re using. With two FlexVolt batteries in series, some of their tools run on 120V, giving these battery powered tools the same power output of any corded AC powered equivalents. This means that you can get a battery chainsaw, miter saw and a whole range of other tools that perfectly match the performance traditionally associated AC powered versions. The FlexVolt technology makes use of 15 X 4V cells inside a robust battery housing. These cells are connected in series using two switching modes. When selected for 20V, the battery will connect 3 banks of cells in parallel. Each bank will consist of 5 cells connected in series (5 x 4 = 20). The effect is 3 times the AH rating at 20V, a 9AH battery will deliver 27AH at 20V, there is no other 20V battery that can offer this kind of running time. When the battery is switched to 60V, all of the cells are connected in series (15 X 4 = 60). So this means that the AH remains at the rated 6AH or 9AH but at three times the voltage. A motor that runs at higher volts draws less current, meaning a lower amp rating. The FlexVolt battery system is unique and offers you the ultimate in battery technology. If you’re using the DeWalt Power Station, you have the advantage of being able to charge four batteries simultaneously. So whether you’re using these batteries to give AC power through the Power Station inverter or using them in your battery tools, you have a good supply of fully charged batteries all the time. Learn more about FlexVolt on the DeWalt site.